disvell has no other items for sale. Lethal Enforcers for Super Nintendo is an in-home game that takes you back to the fun days of coin-operated video games of the early- to mid-1990s. 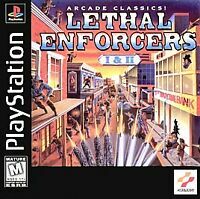 In this prequel to Lethal Enforcers II: Gun Fighters, you'll enjoy a classic Konami shooter-genre arcade game that lets you protect the streets as a green Patrolman. You'll attempt to save the day by preventing an airline hijacking at Chicago International Airport. Along the way, you'll attempt to shoot and eliminate all hostile forces in your path. For its violence, this title receives a rating for Mature Audiences.The main character in Lethal Enforcers"for Super Nintendo is a Chicago policeman named Don Marshall. He's an elite officer in a city so violent that the other officers in his unit have been killed. One day after finishing a doughnut in a coffee shop, Marshall gets a call from his superiors. He's told that a large and ruthless crime syndicate is now operating in his city. Energized when his bosses beg him for help, he hits the streets running. His first move is to check in at a bank, and from there the action begins. Players engage in high-speed car and helicopter chases and keep shooting throughout.Starting with a training phase, players in Lethal Enforcers move up in levels. There are six of these in total, and expert players can make it all the way to the Chemical Plant Sabotage stage. The goal of the game is to shoot bad guys without injuring civilians. It's clear who the criminals are because their faces are covered with masks of sunglasses. There is an onslaught of criminals near the end of each level. This is when criminal bosses appear. Shooting a criminal boss earns bonus points. Weapons pop up throughout Lethal Enforcers to assist players in their fight against evil. These range from a .357 magnum pistol to a grenade launcher. No matter which weapon is being used in play, up to six shots can be fired. To reload, players fire away from the screen. A second player can also play the game as a helper to the main character. The visuals of this game use photographs of actual city locales. The Chicago skyline is visible, and police officers wear badges based on actual insignias. In short, the environments are gritty and realistic. Taunts from criminals and pleas from civilians continue throughout the game and lend to its tense atmosphere. A player starts with five lives and loses one whenever they are shot by a criminal. Accidentally shooting a civilian or fellow officer in Lethal Enforcers also leads to the loss of a life. Shooting civilians leads to demotion in rank as well. Players advance in rank as their accuracy level improves from sergeant all the way to commander. Gamers can also switch between Arcade mode and Street mode. In the former, players advance through the levels in order. In the latter, they can pick which level they want to play next. In both fighting modes, players take time away from the streets to perform target practice. 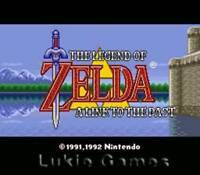 this is a awesome video game for the super Nintendo!! 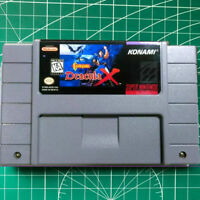 a must have for anyone who owns a super Nintendo!!! this game is a new classic! be sure to get the gun accessory with this game!! before you know you be shooting it out with the bad guys!! this game has numerous levels to challenge your shooting skills!! but be careful and check your targets and be sure not to shoot any civilians!! I love everything about this video game!!!! it's a shame they don't make video games like this anymore in my opinion!! five stars!!! A very good shooting game, but when you play it with the gun, you have lots of fun. Very good acessory that you can use in others SNES shooting games. I remember back when this game came out. I was in awe, but now it's just good for nostalgia not much more. It's a must have for a light gun collector though. I like the game. I liked to play it when I was a kid. I didn't have this game, so I decided to buy it, and it's working great.